In the past couple of years, I've gotten back into composing music after a fifteen year break. I had originally stopped making music without any expectation that I'd ever do it again. Making music had become extremely stressful due to two factors: economics, and proprietary software. Briefly, I'd assumed that I needed to make money from music because I believed I had no other skills. This lead to a very fear-driven and unpleasant composition process more suited to producing periodic mild mental breakdowns than listenable music. Additionally, all of the software I was using to make music was the standard vendor lock-in proprietary fare; That's a nice studio you have here, it'd be a shame if you stopped paying thousands of monetary units per year to keep it working exactly the same way it always has and something happened to it... What? You want to use some different software and migrate your existing data to it? Ha ha ha! You're not going anywhere! So I gave up and got into software instead. Fast forward fifteen years and now, as a (presumably) successful self-employed software engineer and IT consultant, economics are no longer a factor. Additionally, after fifteen years of using, contributing to, developing, and publishing open-source software, coupled with huge advances in the quality of all of the available open-source music software - I no longer have any desire or use for proprietary audio software. There is nothing that any proprietary audio software vendor can offer me that I could conceivably want. As I mentioned, my music composition process in the distant past had been very fear-driven, and I'd accumulated a ton of rather destructive mental habits. However, fifteen years of meditation and other somewhat occult practices have left with me the tools needed to recognize, identify, and extinguish those mental habits. One habit that I identified very early turned out to be one that was common amongst other musicians I know. Specifically: Too much detail too soon. In essence, it's very easy in modern electronic music composition environments to write four bars of music (looping the music continuously as you write), and progressively add more and more detail to the music, and do more and more tuning and adjustments to the sounds. Before long, eight hours have passed and you have four very impressive bars of music, and no idea whatsoever as to what the next four bars are going to be. Worse, you've essentially induced a mild hypnotic trance by listening to the same section of music over and over, and have unconsciously cemented the idea into your mind that these four bars of music are going to be immediately followed by the same four bars. Even worse; you've almost certainly introduced a set of very expensive (in terms of computing resources here, but perhaps in terms of monetary cost too, if you're that way inclined) electronic instruments and effects in an attempt to get the sound just the way you like it, and you may now find that it's practically impossible to write any more music because the amount of electronic rigging has become unwieldy. If you're especially unlucky, you may have run out of computing resources. Better hope you can write the rest of the music using only those instrument and plugin instances you already have, because you're not going to be creating any more! Once I'd identified this habit, I looked at ways to eliminate it before it could manifest. I wanted to ensure that I'd written the entirety of the music of the piece before I did any work whatsoever on sounds or production values. The first attempt at this involved painstakingly writing out a physical score in MuseScore using only the built-in general MIDI instruments. The plan was to then take the score and recontextualize it using electronic instruments, effects, et cetera. In other words, the composition would be explicitly broken up into stages: Write the music, use the completed music as raw MIDI input to a production environment, and then manipulate the audio, add effects, and so on to produce a piece that someone might actually want to listen to. As an added bonus, I'd presumably come away with a strong understanding of the music-theoretic underpinnings of the resulting piece, and I'd also be forced into making the actual music itself interesting because I'd not be able to rely on using exciting sounds to maintain my own interest during the composition process. The result was successful, but I'd not try it again; having to write out a score using a user interface that continually enforces well-formed notation is far too time consuming and makes it too difficult to experiment with instrument lines that have unusual timing. MuseScore is an excellent program for transcribing music, but it's an extremely painful and slow environment for composition. In defense of MuseScore: I don't think it's really intended for composition. Subsequent attempts to compose involved writing music in a plain MIDI sequencer on a piano roll, but using only a limited number of FM synth instances. Dexed, specifically. These attempts were mostly successful, but I still felt a tendency to play with and adjust the sounds of the synthesizers as I wrote. The problem was that the sounds that Dexed produced were actually good enough to be used as the final result, and I was specifically trying to avoid doing anything that could be used as a final result at this stage of the composition. So, back to the drawing board again. I reasoned that the problem was down to using sounds that could conceivably appear in the final recording and, quite frankly, being allowed any control whatsoever over the sounds. An obvious solution presented itself: Write the music using the worst General MIDI sound module you can find. Naming no names, I found a freely-available SoundFontⓡ that sounded exactly like a low-budget early 90s sound module. Naturally, I could never publish music that used a General MIDI sound module with a straight face. This would ensure that I wrote all the music first without any possibility of spending any time playing with sounds and then (and only then) could I move to re-recording the finished music in an environment that had sounds that I could actually tolerate. Attempts to compose music in this manner were again successful, but it became apparent that General MIDI was a problem. The issue is that General MIDI sound modules attempt to (for the most part) emulate actual physical acoustic instruments. This means that if you're presented with the sound of a flute, you'll almost certainly end up writing monophonic musical lines that could conceivably be played on a flute. The choice of instrument sound inevitably influences the kind of musical lines that you'll write. Sounded bad. This ensures that the sounds chosen during the writing of the music won't be the sounds that are used in the final released version of the piece. Sounded different to each other. A musician who's opinion I respect suggested that I use pure sine waves. The problem with this approach is that once you have four or five sine wave voices working in counterpoint, it becomes extremely hard to work out which voice is which. I need sounds that are functionally interchangeable and yet are recognizably distinct. Sounded abstract. I don't want to have any idea what instrument the sound is supposed to represent. It's better if it doesn't represent any particular instrument; I don't want to be unconsciously guided to writing xylophone-like or brass-like musical lines just because the sound I randomly pick sounds like a xylophone or trumpet. Required little or no computing resources. I want to be able to have lots of instruments without being in any way concerned about computing resource use. Additionally, I don't want to deal with any synthesizer implementation bugs during composition. jsamplebuffer provides a simple Java API to make it easier to work with buffers of audio samples. jnoisetype provides a Java API and command-line tools to read and write SoundFontⓡ files. I then went through hundreds of Dexed presets collected from freely-available DX7 patch banks online, and collected 96 sounds that were appropriately different from each other. I put together some Ardour project files used to export the sounds from Dexed instances into FLAC files that could be sliced up programatically and inserted into a SoundFontⓡ file for use in implementations such as FluidSynth. A SoundFontⓡ that no sensible person could ever want to use. 96 instruments using substandard 22khz audio samples, each possessing the sole positive quality that they don't sound much like any of the others. Every note is overlaid with a pure sine wave to assist with the fact that FM synthesis tends to lead to sounds that have louder sideband frequencies than they do fundamental frequencies. All instruments achieve sustain with a simple crossfade loop. Hopefully, none of the instruments sound much like any known acoustic instrument. The only percussion sounds available sound like someone playing a TR-808 loudly and badly. If I hear these sounds used in recorded music, I'm going to be very disappointed. Keys are published to the keyservers as usual. I do a bit of 3D rendering now and then using Blender. Blender has multiple rendering engines: Blender Internal and Cycles. Blender Internal is a 1990s style CPU-based raytracer, and Cycles is a physically-based renderer that can be executed on either CPUs or GPUs. Cycles is technologically superior to Blender Internal in every way except for one: The performance when running on CPUs is essentially hopeless. In order to get reasonable render times, you really need a powerful GPU with an appropriate level of driver support. I refuse to use proprietary hardware drivers for both practical reasons and reasons of principle. This has meant that, to date, I haven't been able to use Cycles with GPU acceleration and have therefore stuck to using Blender Internal. As I don't aim for photorealism in anything I render (I prefer a sort of obviously-rendered pseudo-impressionist style), Blender Internal has been mostly sufficient. However, I've recently moved to rendering 1080p video at 60fps. This means that even if it only takes ~10 seconds to render a single frame, that's still about 35 hours of rendering time to produce a 3.5 minute video. I have a few machines around the place here that spend a fair amount of time mostly idle. I decided to look for ways to distribute rendering tasks across machines to use up the idle CPU time. The first thing I looked at was netrender. Unfortunately, netrender is both broken and abandonware. I spent a good few hours spinning up VM instances and trying to get it to work, but it didn't happen. I've been using Jenkins for a while now to build and test code from hundreds of repositories that I maintain. I decided to see if it could be useful here... After a day or so of experimentation, it turns out that it makes an acceptable driver for a render farm! I created a set of nodes used for rendering tasks. A node in Jenkins speak is an agent program running on a computer that accepts commands such as "check out this code now", "build this code now", etc. I won't bother to go into detail on this, as setting up nodes is something anyone with any Jenkins experience already knows how to do. Nodes can be assigned labels so that tasks can be assigned to specific machines. For example, you could add a linux label to machines running Linux, and then if you had software that would only build on Linux, you could set that job to only run on nodes that are labelled with linux. Basically, I created one node for each idle machine here and labelled them all with a blender label to distinguish them from the nodes I use to build code. I then placed my Blender project and all of the required assets into a Git repository. def nodes = nodesByLabel label:"blender"
This uses the pipeline-utility-steps plugin to fetch a list of online nodes with a particular label from Jenkins. I make the simplifying assumption that all online nodes with the blender label will be participating in render tasks. I assign each node a number, and I create a new task that will run on each node that runs a render.sh shell script from the repository. The tasks are executed in parallel and the job is completed once all subtasks have run to completion. The --frame-start parameter indicates at which frame the node should start rendering. The --frame-end parameter indicates the last frame to render. The --frame-jump parameter indicates the number of frames to step forward each time. We pass in the node index (starting at 0) as the starting frame, and the number of nodes that are participating in rendering as the frame jump. Let's say there are 4 nodes rendering: Node 0 will start at frame 0, and will then render frame 4, then frame 8, and so on. Node 1 will start at frame 1, then render frame 5, and so on. This means that the work will be divided up equally between the nodes. There are no data dependencies between frames, so the work parallelizes easily. When Jenkins is instructed to run the job, all of the machines pull the git repository and start rendering. At the end of the task, they upload all of their rendered frames to a server here in order to be stitched together into a video using ffmpeg. Initial results seem promising. I'm rendering with three nodes, and rendering times are roughly 30% of what they were with just the one node. I can't really ask for more than that. Rendering can't be easily resumed if the job is stopped. This could possibly be mitigated by building more intelligence into the render.sh file, but maybe not. Work is divided up equally, but nodes are not equal. I initially tried adding a node to the pool of nodes that was much slower than the others. It was assigned the same amount of work as the other nodes, but took far longer to finish. As a result, the work actually took longer than it would have if that node hadn't been involved at all. In fact, in the initial tests, it took longer than rendering on a single node! There's not really a pleasant way to estimate how much longer rendering is going to take. It's pretty hard to read the console output from each machine in the Jenkins UI. Finally: All of this work is probably going to be irrelevant very soon. Blender 2.8 has a new realtime rendering engine - EEVEE - which should presumably mean that rendering 3.5 minutes of video will take me 3.5 minutes. Big thanks to Aleksey Shipilev for adding file lists and sizes to builds.shipilev.net so that CoffeePick can efficiently enumerate builds on the site. ... the binaries there are very volatile by nature, many rotate daily, so hooking them up to something more or less permanent would be problematic. Expect to have to run repository-update urn:net.shipilev.builds every day if you use the repository! A while back, I talked about moving to the bndtools suite of Maven plugins in preference to the Felix bundle plugin. The reason for this is better cross-IDE compatibility: Eclipse only really works with bndtools, whilst Intellij IDEA only really works with the Felix maven-bundle-plugin. This means that the plugin you choose to use in your Maven project ends up dictating which IDE developers must use in order to work with it. That's not great! However, I discovered that Intellij IDEA could be configured to use the OSGi manifest file that the bndtools Maven plugin creates, and therefore that means that developers can use either IDE as long as I use the bndtools plugins in my own projects. Unfortunately, upon switching to the bndtools plugin in the primogenitor, I soon ran into MNG-6059 and MNG-5951. Briefly, Maven has some baked-in behaviour that is intended to produce metadata that follows the conventions people used when everyone used SVN to manage source code. However, those conventions result in Maven producing metadata that's essentially incorrect with regards to modern conventions. Specifically, Maven will automatically append module names to URIs specified in your project, because it assumes that you've laid out files in a particular way on remote servers. This automatic name appending could not previously be turned off. However, Maven 3.6.0 provided support for some attributes that you could place into your pom.xml files that would disable this automatic appending. Additionally, 3.6.0 comes with numerous fixes for working with Java 11 bytecode. As I recently decided that Java 11 was the new minimum version that I was going to support, 3.6.0 is really a requirement moving forward. Unfortunately, this has now lead to further problems! One problem is that it's not possible to push a pom.xml file containing the new attributes to Maven Central because the version of Nexus running on Central can't parse the new POM files yet. The second problem is that the attributes are not inherited. I currently have over 850 pom.xml files spread over close to a hundred projects. There's just no way I'm going to edit each and every pom.xml file and add those attributes by hand. I want to specify them once in the primogenitor and have them apply everywhere. I've raised both points on the Maven mailing list, and my cries have been heard. All of this will hopefully be fixed in 3.6.1. After all is said and done, this means that I can't start moving projects to Java 11 just yet or even do a full 3.0.0 release of the primogenitor because I need Maven 3.6.1 to do so. I wasn't available to test 3.6.0 much before it was released, but I can do plenty of testing for 3.6.1. It looks like I'll temporarily be in limbo for a couple of months! Now that jlink exists, it's become fashionable to bundle a JVM along with your Java bytecode. 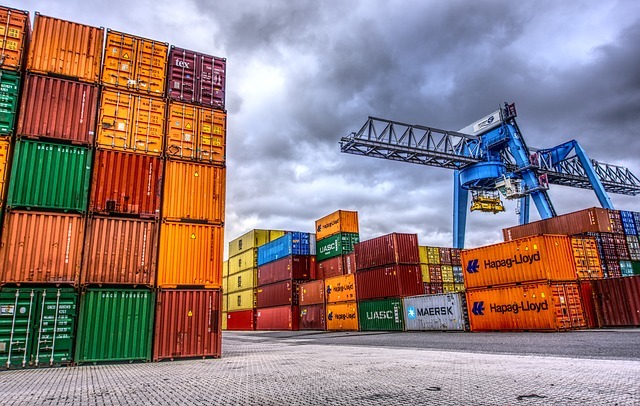 In applications that use the JPMS, the jlink tool can calculate the transitive closure of required modules and produce a tiny JVM that contains your application modules and only those platform modules required to run the application. Because I'm using OSGi, I don't care about this particular aspect of jlink. What I am interested in is that, because of jlink, it has become a lot easier to bundle a JVM with an application. Projects such as AdoptOpenJDK produce production-ready builds of JVMs for a large range of platforms and architectures, including Hotspot and OpenJ9 VMs. Now there is a downside to this: Java applications should, by their very nature, be completely platform-independent. If I give someone a jar file of Java 11 bytecode, it should run correctly on any JVM on any platform supporting Java 11+. If I instead start producing one distribution per platform and architecture including a bundled JVM, then by definition my application distributions are no longer platform-independent. Worse, even though jlink still bundles your application's bytecode along with the produced JVM, that bytecode is (by default) stored in an undocumented binary format along with the platform modules as one indivisible lump. I don't believe it's possible for the user to say "well, I don't want to use the bundled JVM, I'll just point my system JVM at the classes and use that". What I would much rather do is still produce one distribution that contains a bundled JVM for each of the common platforms and architectures (let's say Linux x86_64, Windows x86_64, and MacOS x86_64) but also provide a basic shell script that can be used to start the application from a system JVM if the user so wishes (with the support caveat that if it doesn't work, they're on their own). The bytecode should still be stored exactly as it was in the original jar files (and in my case, would actually have to be stored like this because the jar files are OSGi bundles). The ideal situation would be if I could have a Maven plugin that, given a range of platforms and architectures, automatically fetched one runtime suitable for each platform/architecture and then packaged up the whole application including all of the runtimes into one platform-independent distribution archive. So, I've decided to write one! The CoffeePick project provides an API and an interactive shell used to search for and download Java runtimes. The API works via a pluggable service provider model where new repositories of runtimes can be added at build-time or, if running on OSGi, at run-time. The CoffeePick project currently contains providers for both of those repositories, and the AdoptOpenJDK module automatically finds new builds as the AdoptOpenJDK project publishes them. There now follows small demo of the interactive shell. The shell uses jline3 internally and so has a full command-line history and limited tab-completion for command names. MODULES="java.base java.compiler java.datatransfer java.xml java.prefs java.desktop java.instrument java.logging java.management java.security.sasl java.naming java.rmi java.management.rmi java.net.http java.scripting java.security.jgss java.transaction.xa java.sql java.sql.rowset java.xml.crypto java.se java.smartcardio jdk.accessibility jdk.internal.vm.ci jdk.management jdk.unsupported jdk.internal.vm.compiler jdk.aot jdk.internal.jvmstat jdk.attach jdk.charsets jdk.compiler jdk.crypto.ec jdk.crypto.cryptoki jdk.dynalink jdk.internal.ed jdk.editpad jdk.hotspot.agent jdk.httpserver jdk.internal.le jdk.internal.opt jdk.internal.vm.compiler.management jdk.jartool jdk.javadoc jdk.jcmd jdk.management.agent jdk.jconsole jdk.jdeps jdk.jdwp.agent jdk.jdi jdk.jfr jdk.jlink jdk.jshell jdk.jsobject jdk.jstatd jdk.localedata jdk.management.jfr jdk.naming.dns jdk.naming.rmi jdk.net jdk.pack jdk.rmic jdk.scripting.nashorn jdk.scripting.nashorn.shell jdk.sctp jdk.security.auth jdk.security.jgss jdk.unsupported.desktop jdk.xml.dom jdk.zipfs"
Finally, it's possible tell repository providers to self-update. This is useful in the case of a repository such as AdoptOpenJDK where new runtime builds are published frequently. Subsequent executions of the catalog command will then show new releases (if any are available) in addition to those that were already available. I want to be able to do all of the above in an automated manner during builds. The API already allows for electively downloading or reusing cached runtimes, and runtimes can be specified directly by hash value for reproducibility in builds. Aleksey Shipilëv publishes various early-access builds so that people can try out new JDK features. I'd like to get his builds included into a repository provider (ideally with some way to find new builds without having to crawl over his entire site to discover them). I already have a very strict XSD schema that describes a format for repository metadata. It would just be a matter of persuading others to use it, and allowing the API to consume XML metadata. Maven 3.6.0 was released today. It adds the ability to add a child.inherit.append.path attribute to various places within a POM file to turn off Maven's automatic appending of child module names to various paths. This has been a long-standing complaint with Maven as it had essentially baked-in SVN path semantics to the model in a way that couldn't be turned off or worked around sanely. [ERROR] Rule failure while trying to close staging repository with ID "comio7m-1402". [ERROR]  * Dropping failed staging repository with ID "comio7m-1402" (Rule failure during close of staging repositories: [comio7m-1402]). Java 11 is out, and is the current LTS release (at least if you're using the Oracle JDK). I'll be moving all of my code to start requiring JDK 11 at a minimum as of now. Additionally, Maven 3.6.0 is currently in the process of being released, and it contains a fix for an issue that's important to me, so I suspect I'm also going to start requiring Maven 3.6.0 everywhere too. I'm dropping OpenGL in favour of Vulkan. No more broken drivers (probably). No more dealing with source code level management of shader code at runtime (no more sombrero). No more broken GLSL shader compilers, for that matter. No more weak typing (no more jcanephora). No more logarithmic depth buffer - Vulkan has reversed floating-point depth buffers accessible without extensions. Planning to rewrite r2 using Vulkan, yielding r3. A few design issues that were imposed by the OpenGL 3.3 core requirement can be corrected. Still need to give the Vulkan API a friendly face though, to make it feel like a Java API instead of a C++ API. A while ago I started having a problem with signature verification when trying to upload to Maven Central. After three months of intense debugging and a rather long conversation with Sonatype, it turned out that the issue was actually with the signing key. At the start of 2018, I'd switched to ed25519 signing keys. It turned out that the version of Nexus running on Maven Central didn't support ed25519. To work around this, I created a new RSA key solely intended for signing Maven packages. Bizarrely, this key didn't work either. Nobody could work out why the signatures were failing, and the problem was escalated twice to Sonatype's internal support people. It turned out that the problem was an ed25519 signature on the new RSA key! The moral of the story: If you want to deploy to Maven Central, use only RSA keys and make sure that the signatures on those RSA keys only come from other RSA keys. If you fail to do this, you won't get an actionable error message when you try to deploy packages, you'll just get a "Signature verification failed" message. Sonatype are updating their documentation to ensure that nobody else has to lose time to this. Thanks to Joel Orlina for being patient during those three months and for handling the support teams. It's been about eight months since the release of Java 9. I won't bore anyone with the details of everything it introduced as that information is available just about anywhere you care to look. The main thing it added, however, is the subject of this post: The Java Platform Module System. The JPMS was introduced, and programmers reacted in the normal way that people working in a field that's supposed to demand a rational and critical mind react: They started frothing at the mouth, claiming that Oracle were trying to kill Java, and planning a mass exodus to other more hip languages. Kotlin or Rust, probably. Needless to say, Oracle weren't trying to kill Java. If Oracle wanted to kill Java, they could certainly find a way to do it that didn't require seven expensive years of intense, careful, and painful software engineering. So far, the exodus appears to have been quietly called off. I'm guessing the people that complained the loudest are the sort of people that write a ton of fragile, error-prone, unsupported reflection hacks and then spew bile when some tiny aspect of the platform changes and their code breaks. I have a ton of code, none of which I'd describe as legacy. I'm somewhat invested in OSGi for reasons I'll go into shortly. Today: I'm conflicted and slightly nervous! I decided when Java 9 came out that I was going to pursue full modularization for all of my projects. As I've said before, my code is already modular because I've been designing it around OSGi. However, in order for it to become modular in the JPMS sense, I'd have to write module descriptors for each project. OSGi has a full repository specification that gives applications the ability to download and install packages at run-time. You tell the system what packages you want, and it fetches those and all of their dependencies. Everything is standardized, from the API to the actual metadata served by repository implementations. Here's an example of a standard repository index (albeit styled with an XSL stylesheet). OSGi bundles have rich metadata associated with them, including very fine-grained and versioned dependency metadata. If you have a bundle, you can find out very easily what else you need in order to be able to use it. The metadata can also express things beyond simple package dependencies. OSGi can load and unload modules at run-time, and has standard APIs to do so (and standard APIs that application code can implement in order to react to modules being loaded and unloaded). OSGi has wide support; it's fairly rare these days to find a Java project that isn't also implicitly an OSGi project. Making something OSGi-compatible is often just a case of adding a single Maven plugin invocation (assuming that the code doesn't make a lot of unfounded assumptions about class loaders). The JPMS doesn't have anything like a repository specification. The closest analogy is probably fetching things off of Maven Central, but there's no standard API for doing this. Essentially, obtaining modules is Someone Else's Problem. JPMS modules don't have much metadata associated with them. A module says what packages it exports and upon which other modules it depends. However, it doesn't say anything about which versions of those modules are required. Essentially, you're expected to use a system like Maven. This is Someone Else's Problem. The JPMS can, in some sense, load modules at run-time via ModuleLayers. There's no support for explicitly unloading a module. There are no standard APIs that code can use to be notified that a module has been loaded. Essentially, you're expected to build your own ad-hoc OSGi-like system on top of module layers. This is Someone Else's Problem. Most projects haven't even begun to modularize their code. Even in a well-staffed and extremely fundamental project like Google Protobuf, I'm still waiting after six months for them to make a harmless one-line JAR manifest update. I cannot begin to imagine what it would take to push full modularization through a system that slow moving. If a project you depend on hasn't modularized, you're not going to be modularizing either. The first three points mean that I'd have to invent my own OSGi-like system. I'd have to come up with a uniform, platform-agnostic metadata standard that could be inserted into JAR files in order to specify dependency information. Third party projects (at least those that aren't written specifically for my game engine) aren't going to be interested in adding metadata for the sake of one man's low budget module system. I can't trust JAR files to contain Maven pom.xml files (although many do), as there are plenty of other build systems in use that don't include that information. Even then, you can't just parse a Maven pom.xml, you need to evaluate it. This would mean pulling in Maven APIs as a dependency, and those neither work in a JPMS modular context (because they're not modularized and never will be) nor an OSGi context (because they use their own incompatible module system called Plexus). Let's assume by some miracle that I get a good percentage of the Java ecosystem to include dependency metadata in a format I can consume. I now need to come up with an API and tools to fetch modules from a repository. That's not hard, but it's still more than not having to do it at all. I'd want version ranges, so I'd also need to write code to solve the versioning problem which is NP-complete. Tricky. So let's assume by now that I can, given the name of a module, fetch the dependencies at run-time using my shiny new API and metadata. I still need to be able to load and unload that set of modules at run-time, and have code in other modules react properly to that occurring. There aren't any standard APIs to do this in the JPMS, and so I'd have to write my own. Right now, the JPMS is not actually capable of expressing the kind of things that are possible with OSGi bundles, so any system I built would be strictly less capable than the existing OSGi system. At least part of the problem appears to come down to missing APIs in the JPMS, so at least some of this might be less of an issue in the future. Still, it's work I'd have to do. So let's assume that I can fetch, load, and unload modules at run-time, and code in modules can react to this happening. I still need modules to put in the system, and not many Java projects are modularized. I tried, for a few months, to use only projects that have either added Automatic-Module-Name entries to their JAR manifests, or have fully modularized. It was fairly painful. I'd be limiting myself to a tiny percentage of the vast Java ecosystem if I did this. This, however, is something that OSGi also went through in the early days and is no longer a problem. It's just a matter of time. So why am I nervous and still conflicted? The default effect suggests that, just because the JPMS is the default Java module system, the JPMS is the one that developers will turn to. Tool support for JPMS modules is already vastly better in Intellij IDEA than it is for OSGi. In Eclipse, the support is about equal. The OSGi R7 JAR files will not contain Automatic-Module-Name entries which means that if you have any dependency on any part of OSGi (including parts that are not even used at run-time, like the annotations), your code cannot be fully modularized. If developers are forced to choose between supporting that old module system that nobody uses or that shiny new default module system that everyone's talking (or possibly frothing) about, which one do you think they'll pick? I'm also aware that this kind of dynamic module loading and unloading is not something that most applications need. For years people were happy with a static (although extremely error-prone) class path mechanism, and the majority of applications are just recompiled and re-deployed when updated. The JPMS can support this kind of deployment sufficiently. Previously, if developers wanted any kind of safe module system at all, they had to turn to OSGi. They might only use it in the context of a static application that is not dynamically updated, but they'd still use it. Why would those same developers still turn to OSGi when the JPMS exists? Finally, I pay attention to the various new developments to the Java language and JVM and, fairly often, new features are proposed that have subtle (or not-so-subtle) dependencies on the new module system. There are various optimization strategies, for example, that can be enabled if you know that instances of a given type are completely confined to a single module. Unless the VM can be magically persuaded that OSGi bundles are JPMS modules (this is unlikely to happen), then code running in OSGi is very much going to become a second-class citizen. So, I'm nervous and conflicted. I don't want to build some sort of ad-hoc OSGi-lite system on the JPMS. I don't want to do the work, I don't want to maintain it, and I don't think the result would be very good anyway. I also, however, am unsure about continuing to base my code on a system that's going to have to work hard not to be considered irrelevant. I believe OSGi is the superior choice, but it's not the default choice, and I think that's going to matter more than it should. I suspect I'm going to finish assisting any remaining projects that I've started helping to modularize, and not do any more. I had decided that I was going to push hard to move all of my projects to requiring Java 9 as part of the modularization effort, but unfortunately this would leave me unable to deploy code on FreeBSD as there's no JDK 9 there and likely won't be. With the new six-month release cycle (and 18-month long-term release cycle), porting efforts will likely be directed towards JDK 11. This means that I won't be able to deploy anything newer than Java 8 bytecode on FreeBSD for at least another six months. Linux doesn't accept router advertisements by default. If you configure your router to tell everyone on the network that it has a nonstandard MTU, Linux will ignore the advertisements. Linux will act upon any Packet Too Large messages it receives and in fact will create a temporary route (visible from the ip route command) that has the correct reduced MTU but, for whatever reason, most programs won't use the new route without a restart. That is, if my mail client hangs due to a Packet Too Large message, it won't be able to send any mail until I restart the program. Usually, net.ipv6.conf.default.accept_ra_mtu is already set to 1, but it's worth being explicit about it. I also add net.ipv6.conf.default.autoconf=0 because I statically assign addresses. The second point can be addressed by restarting the program, as sad as that is. I'm trying to get to the point where all of my projects are fully modularized as JPMS modules. My code already follows a very modular architecture thanks to designing it around OSGi, but it's necessary to write module descriptors to complete the picture. To write module descriptors, the projects upon which a project depends must first be modularized. This can either mean writing module descriptors for those projects, or it can simply mean assigning an Automatic-Module-Name. Writing a full module descriptor is better, because this means that the project can be used in combination with jlink to produce tiny custom JVM distributions. My problem is that I have rather a large number of dependencies across all of my projects, and I need to know the most efficient order in which to approach maintainers in order to get them to modularize their projects. If a project A depends on project B, then project A can't be modularized before project B so it's a waste of my time to go asking project A's maintainers before B is modularized. I wrote a Maven plugin to assist with this problem. It produces reports like this. The plugin tells me if the current version of a dependency is modularized, if the latest version of the dependency on Maven Central is modularized, and whether the dependency has been fully modularized or simply assigned a name. The table of dependencies is shown in reverse topological order: Start at the top of the table and work downwards, contacting each project maintainer as you go. Some dependencies will, of course, never be modularized. Whomever published the javax.inject jar, for example, didn't even bother to create a manifest in the jar file. I'm not sure that even constitutes a valid jar file according to the specification. Some dependencies, like javaslang, were renamed (javaslang became vavr) and so code should move to using the newer names instead. Some projects can barely manage to publish to Maven Central (like Xerces) and still appear to use tools and processes from the previous century, so are unlikely to be modularizing any time soon. In a crippling bout of sinusitis, and after reading that Chrome is going to mark http sites as insecure, I decided to put good sense aside and deploy Let's Encrypt certificates on the io7m servers. I've complained about the complexity of this before, so I started thinking about how to reduce the number of moving parts, and the number of protection boundary violations implied by the average ACME setup. The web server must not have write access to its own configuration, certificates, or logs. This is generally a given in any server setup. Logging is actually achieved by piping log messages to a log program such as svlogd which is running as a different user. In my case, I can actually go much further and state that the web server must not have write access to anything in the filesystem. This means that if the web server is compromised (by a buffer overflow in the TLS library, for example), it's not possible for an attacker to write to any data or code without first having to find a way to escalate privileges. The web server must have read access to a challenge directory. This is the directory containing files created in response to a Let's Encrypt (LE) challenge. The acme client must have read and write access to the certificates, and it must have write access to a challenge directory, but nothing else in the filesystem. Specifically, the client must not have write access to the LE account key or the directory that the web server is serving. This means that if the client is compromised, it can corrupt or reissue certificates but it can't substitute its own account key and request certificates on behalf of someone else. The acme client must not have any kind of administrative access to the web server. I don't want the acme client helpfully restarting the web server because it thinks it's time to do so. There are some contradictions here: The acme client must not be able to write to the directory that the web server is serving, and yet the web server must be able to serve challenge responses to the LE server. The acme client must not be able to restart the web server, and yet the web server must be restarted in order to pick up new certificates when they're issued. An httpd-reloader service sends a SIGHUP signal to the web server every 30 minutes. This causes the web server to re-read its own configuration data and reload certificates, but does not kill any requests that are in the process of being served and specifically does not actually restart the web server. The acme client writes to a private challenge directory, and a private certificates directory. It doesn't know anything about the web server and is prevented from accessing anything other than those directories via a combination of access controls and chrooting. The web server reads from a read-only nullfs mount of a wwwdata directory, and the challenge directory above is placed in wwwdata/.well-known/acme-challenge via another read-only nullfs mount. 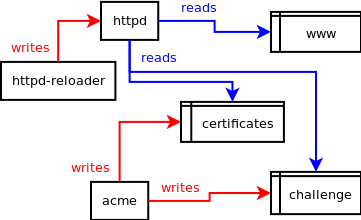 The web server also reads from a read-only nullfs mount of the certificates directory above in order to access the certificates that the acme client creates. The acme client is told to update certificates hourly, but the acme client itself decides if it's really necessary to update the certificates each time (based on the time remaining before the certificates expire). The intrusion detection system has to be told that the web server's certificates are permitted to change. The account key is never permitted to change. I don't want notifications every ~90 days telling me the certificates have been modified. I set up all of the above and also took some time to harden the configuration by enabling various HTTP headers such as Strict-Transport-Security, Content-Security-Policy, Referrer-Policy, etc. I'm not going to require https to read io7m.com and I'm not going to automatically redirect traffic from the http site to the https site. As far as I'm concerned, it's up to the people reading the site to decide whether or not they want https. There are plenty of browser addons that can tell the browser to try https first, and I imagine Chrome is already doing this without addons. Now we can all sleep soundly in the knowledge that a third party that we have no reason whatsoever to trust is telling us that io7m.com is safe. I'm going to start making all projects use a common set of Checkstyle rules rather than having each project carry its own rules around. I can't remember exactly why I avoided doing this in the beginning. I think it may've been that I wasn't confident that I could write one set of rules that would work everywhere. I've decided instead that I'll beat code with a shovel until it follows the rules, rather than beat the rules with a shovel until they follow the code. The reasons for this are documented on Stephen Colebourne's blog. Generally, if a project isn't planning to either modularize or publish automatic module names, then I'm looking for a replacement for that project. New PGP keys have been published. Note that the 8168DAE22B15D3EDC722C23D0F15B7D06FA80CB8 key ID assumes you're reading this in 2017. By the time 2018 comes around, this blog will be signed with a new key (and a new one for each passing year). A malicious actor gets the remote keyserver to serve a different key than the one with fingerprint 8168DAE22B15D3EDC722C23D0F15B7D06FA80CB8. Does gnupg verify that a received key had the fingerprint that the user specified on the command line? What if the user specified my name and key comment instead of a fingerprint? The actor at this point might be able to convince you that the signatures on files on blog.io7m.com are invalid. It might be able to convince you that its own key is mine. A malicious actor modifies the files and signatures when wget downloads them. The actor can't generate valid signatures for the key 8168DAE22B15D3EDC722C23D0F15B7D06FA80CB8 (unless it can break RSA), but it can try to convince you that its own key is actually my key and therefore have you trust that the data you're seeing is unmodified and was signed by me. If the actor managed to perform step 1 above, then you're completely compromised. A malicious actor removes some of the signatures. If you didn't know exactly how many pages there should be, you'd not notice if gpg didn't verify one of them. Step 1 has no technical solution; you need to verify the keys you receive and check the signatures on those keys assuming they come from other keys that you trust. If you're lucky, there is a chain of signatures leading to a key that you do trust with certainty. I have yearly expiring keys, and I sign each new year's keys with the old keys. Unless my keys have been compromised yearly, there's a reasonable chance that the keys you see are mine! Step 2 is partially mitigated by https, assuming that the actor doesn't have backdoor access to the CA issuing the certificate. The actor can have the CA issue a new certificate, redirect you to a server that the actor controls, decrypt the traffic, modify it, and then re-encrypt it. You'd never know anything was wrong. Step 3 is manually mitigated by reading the posts by year page and checking that you have at least as many signatures as pages. I may start publishing a CHECKSUMS file that just contains signed SHA512 hashes of every file on the site. I'm considering using keybase in addition to publishing PGP keys on the public keyservers. I don't do social media, so I'm not sure how much it'd apply to me. I do use GitHub heavily though. be switching to ed25519 keys from RSA). I initially wrote jstructural as a set of XSLT stylesheets. That quickly became unmaintainable as the complexity of the stylesheets increased. I rewrote them in Java. I eventually got tired of writing documentation in XML (I didn't know that better XML editors existed) so I ended up wanting to add the ability to write documents as S-expressions. The right way to do this was to redesign jstructural so that it defined a core AST type and added multiple parsers that all produced values of this core type. Converting between documents of different types would then be a matter of parsing using one syntax, and then serializing the AST using another. The most natural way to express an AST is as a large algebraic data type. Java doesn't have direct support for these yet (although it's slowly getting them via Project Amber). I therefore looked at other JVM languages that did support them, and the choice was either Scala or Kotlin. I chose Kotlin, after multiple nasty experiences with Scala. kstructural was born. Fast forward to the present day, and I'm utterly sick of working on Kotlin code. The tools are slow. Compilation is slow. The people in charge of the ecosystem think devolving to special snowflake imperative build tools like Gradle is a good idea. I'm going to do a new Java implementation of the structural language, and I'm probably going to redesign the language to make it even easier to implement. Nowadays, XML editing is fast and painless thanks to various tools (with real-time validation errors). XOM is essentially unmaintained, so I'll replace the XML parsing code with an efficient SAX parser (and actually get lexical information in the parsed AST, unlike with XOM). Deployed DKIM on the mail server today. All mail that originates from io7m.com will be signed, and I've published DMARC and ADSP policies that tell other servers to be suspicious of any mail that isn't signed. Seems to be working well. I've enabled TLS on all io7m.com domains. I'm using certificates from CaCert.org. These aren't trusted by all browsers, but I don't care all that much. If trust becomes a serious issue at some point, I'll buy real TLS certs. I PGP sign all text on the server anyway, so anyone that really cares about checking to see if some nefarious third party has changed the data in transit can do so, albeit manually. No, I'm not using Let's Encrypt. I've looked into it several times and I just can't get around the fact that it requires a huge number of moving parts and that the average ACME client requires a ridiculous level of privileges to work properly: If you want any possibility of security, this is what it takes to get it. The client has to be able to make connections to a remote server in order to download an extremely security-critical bit of data (the certificate). If this step fails for any reason (the remote side being unavailable, breakage in the client), the existing certificate expires and the https service is dead. The client has to be intelligent enough to know when to try to get a new certificate. When is the right time? Who knows. Trying to request a new certificate a minute before the current one expires is suicidally reckless. Trying to do it the day before might be acceptable, but what if it goes wrong? Is a day long enough to try to fix a problem in something as gruesomely complex as the average ACME client? The availability of your https service essentially becomes tied to the availability of the ACME server. This wouldn't be so bad if the update was a yearly thing and could be planned for, but LE certificates are valid for 90 days. The client has to be able to write to the directory being served by the http server in order to be able to respond to challenges. If the client is compromised, it has the ability to trash the served web site(s). I run my services in a highly compartmentalized manner, and having to allow this would be horrible. There are other challenge types, such as publishing a DNS record containing a response to a challenge, but those have the same problem of what should be an unprivileged program having to cross a security boundary and threatening the integrity of another service's data. The client has to be able to write to the http server's configuration data (in order to publish the new certificate). Again, if the client is compromised, it can trash the http server's configuration. If the update fails here, the existing certificate expires and the https service is dead. Assuming that the client actually does manage to respond to a challenge and get a certificate issued, and does actually manage to write that certificate to the filesystem, the problem then becomes getting the https server to use it. Most servers read certificates once on startup and don't reread them. Therefore, the client needs privileges to restart the server. This is totally unacceptable; no service should ever be able to forcefully restart another. There are so many possible points of failure and every single one results in a broken https service at best, or a system compromise at worst. I'm vaguely surprised at how little in the way of criticism I've seen online of the complexity of Let's Encrypt given the usual reaction of information security experts to any new software system. To paraphrase Neal Stephenson, the usual reaction is to crouch in a fetal position under a blanket, screaming hoarsely that the new system is way too complex and is a security disaster. I have to wonder how many unpublished attacks against the ACME protocol there are out there. Contrast this to a typical TLS certificate provider: I download a text file once a year and put it on the server. I then restart the https service. Done. No extra software running, no other points of failure. The Maven JavaDoc plugin 3.0.0 is finally ready for release. This means that I can migrate 60+ projects to Java 9 and finally get the new versions pushed to Central. Big thanks to Robert Scholte who worked hard to ensure that everything worked properly, and even got my rather unusual usage of the plugin (aggregating documentation into a single module) working as well. I've been anxiously awaiting the 3.0.0 release of the maven-javadoc-plugin for weeks, and in an ironic twist of fate, I'm now responsible for delaying the release even further. I found two rather nasty bugs in the version that was to become 3.0.0, but submitted a fix for the first and had it merged. The second problem seems like it's going to take rather more work to fix though, and my message asking for implementation advice to the javadoc-dev list is currently sitting in a moderation queue. pr?The last hour is on us both?mr.s?tuck this little kitty into the impenetrable brainpan? pr?Contents under pressure?Do not expose to excessive heat, vacuum, blunt trauma, immersion in liquids, disintegration, reintegration, hypersleep, humiliation, sorrow or harsh language? pr?When the time comes, whose life will flash before yours? Decided to kill off some old packages. jnull and jfunctional in particular I've used in just about every project I've ever worked on. There's really very little reason for them to exist anymore though. Java 8 added Objects.requireNotNull which standardized terse null checking. Noone cares about the @NonNull annotations (including myself). The entire contents of jfunctional were made redundant by Java 8. Both of these packages served their purposes well back in the days of Java 6 when they were first designed, but now they're just a burden. It's good to throw away code. I'm still waiting on a set of issues to be resolved in order to push modules to all of my projects. MJAVADOC-489 causes JavaDoc generation to fail when one module requires another. MDEP-559 causes the dependency:analyze goal to fail. I use this goal as part of all my builds in order to keep dependencies clean and correct. Getting this fixed depends on MSHARED-660. I've also removed japicmp from all of my builds. I don't want to disparage the project at all; it's good at what it does, but using it would require using custom MAVEN_OPTS on JDK 9, and that's just not good enough. I'm in the process of writing a replacement for japicmp and will announce it within the next few weeks. Instead of using a non-default MTU on my network, I've instead implemented TCP MSS clamping. That rule clamps the maximum TCP segment length on the PPP interface to 1440. Why 1440? It's essentially down to the per-packet overhead of each protocol that's involved. Typically, that'll be 40 or so bytes for an IPv6 packet header, 8 bytes for PPPoE, and some loose change. So far, nothing has broken with the new settings. No TLS handshake failures, no sudden broken pipes on SSH sessions, no issues sending mail.